This is one of my favorite ways to use beets and it is the only way I have found to get people who don't enjoy beets normally, to eat them without complaining. I shared this recipe a couple of years ago, but since I make it quite often, I decided it was time to update the picture. I made this when we had people over for dinner and it was a huge hit. I love making risotto for dinner when people are over because it is fairly easy to make and always a crowd pleaser. I also love the colors and presentation of this dish. It is delicious. Preheat the oven to 425 degrees . In a medium pot, warm the broth over medium heat. In a large, deep skillet or a medium Dutch oven, heat 1 tablespoons olive oil over medium to medium-high heat. Stir in the rice to coat with the oil, and toast for 2 minutes. Add the beets, onion and garlic and cook until softened, about 5 minutes. Pour in 1/2 cup chicken broth and cook until absorbed into the rice, then begin adding broth a couple of ladles at a time, stirring with each addition, until the rice is cooked, about 20 minutes. Season with salt and pepper. While the risotto is working, on a baking sheet, toss the asparagus with the remaining 2 tablespoons EVOO, season with salt and pepper and roast for 10 minutes. 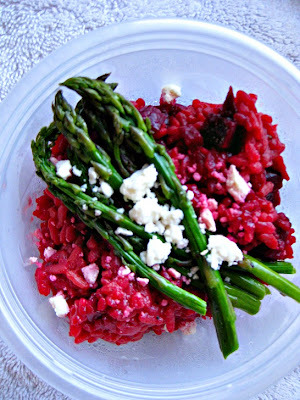 Serve shallow bowls of beet risotto with the roasted asparagus and crumbled cheese on top.